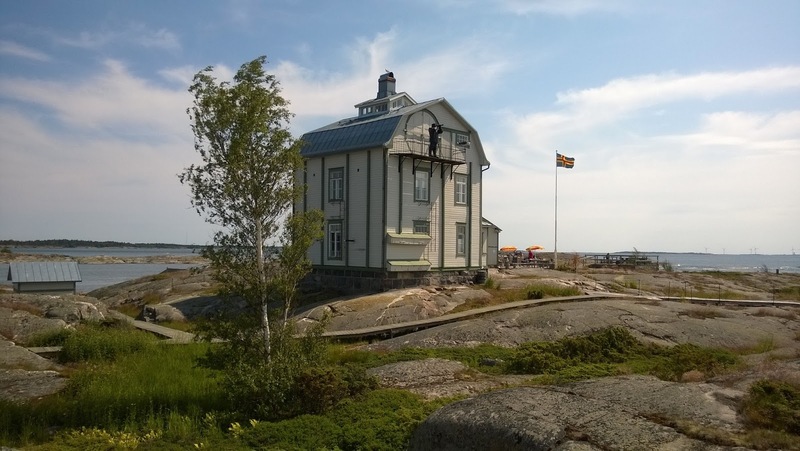 Surprisingly weather forecast was promising sunny and warm days during the weekend and thus I decided to travel to Åland islands and paddle couple of days on the southern part of archipelago. Jumped to the ferry at Turku harbor on Friday evening. At the same time there were Ruisrock - festivals on Ruissalo - island just next to harbor. Thousands of people partying at the festival saw the ferry passing by the festival area. It was blowing strongly, but the forecast promised winds would calm down for Saturday and Sunday. The ferry arrived to Långnäs harbor on Åland at 1 AM after which had a short drive to Västeränga for staying overnight before the paddling. Saturday morning showed off sunny and after packing stuff to kayak was ready to start paddling towards Kobbaklintar roughly 13 km away. Visited Marhällan and Kobbaklintar - daymarks at the time when there was bunch of ferries passing by. Spent many hours on Kobbklintar - island enjoying the views and visiting idyllic cafe. The paddling continued towards Ledskär - daymark via Rödhamn guest harbor. Took pieces of smoked salmon from Rödhamn and paddled 4 more km to Ledskär. It was a bit difficult to find a landing spot, but finally found a rock, where could get ashore and have a short break. 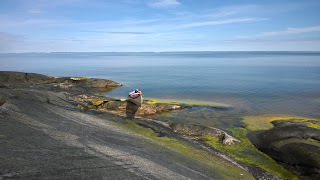 It was evening already and Ledskär didn't seem to be a good place for tenting so decided to paddle still further. Found a beautiful rocks on Norra Askskär. Paddling route for Saturday can be seen from here. It was raining during the night, but the Sunday morning turned out clear and sunny. 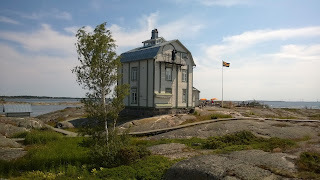 The goal for today was to reach Fästorna - daymark 15 km away on a tiny islet in the middle of the sea. Fortunately there were no winds at all and paddling went easily. After 2,5 hours paddling Fästorna was there and because of the calm waters landing was possible to this small islet. The way back to Västeränga took some 4 hours. Route for Sunday is visible here. All in all paddling distance for these two days were 75 km and visited 4 new daymarks too. Just superb weekend on the sunny Baltic Sea !